This large 11 ¼” Antique Jambati Singing Bowl has a beautiful low perfect pitch second octave F# fundamental (93Hz) when struck with a padded mallet or played around the rim with a suede ringer. It has a pronounced pulse and a long sustain. A C#4 harmonic (288Hz) is also present. The rim note changes to a fifth octave C# (557Hz) when a wooden ringer is employed. 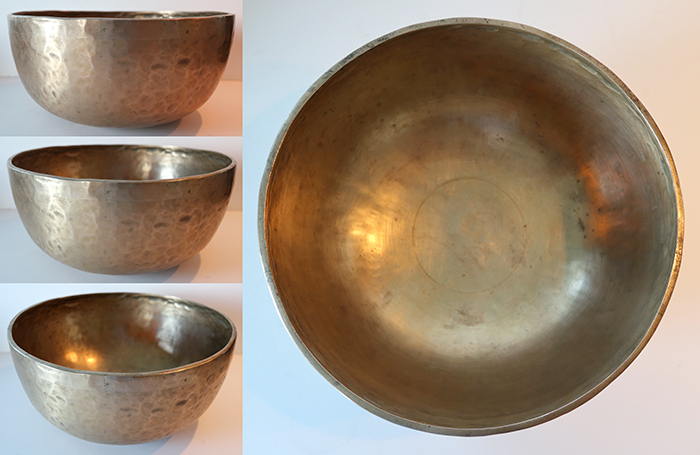 This antique singing bowl has finely hammered walls and a sheered lip with a single decorative band around the outer rim and circles at its centre. It is structurally sound, clean and blemish free, and has an attractive bright golden bronze colour. A Tibetan silk brocade bowl cushion, a padded striker, and a double-ended teak and suede ringer are included in the price. Listen: (2 struck notes and 1 played note).